Our pictures today are, from left to right: heirloom morning glory “Grandpa Ott’s”, and a seedling ivy geranium. This month you can transplant out tender vegetables, early in the month, after frosts. If you have not planted your garden yet you can still purchase and transplant out tender vegetables that require a shorter season (80 days or fewer). Cole crops, such as cauliflower and cabbage, and most every transplantable vegetable can be planted until about July 1, when you could begin to sow fall crops. Fertilize and prune cantaloupes; watch for pests and diseases on garden plants. Keep a watch on watering if weather is dry and hot; weed after watering as plants pull up easily. Vegetables you can direct sow until June 15 include: amaranth, dill, summer savory, edamame beans, chervil, early-maturing corn, NZ and Malabar spinach, carrots, cucumbers, parsnips and pole beans. Sow successive crops all month of: lettuce, spinach, bush beans, beets, cabbages, cucumbers, onions, peas, radishes, potatoes. Transplant out leeks, endive, herbs, plus tender vegetables. Some of these are: tomatoes, eggplant, peppers, cantaloupe, squash, pumpkins, watermelon. Fertilize and prune cantaloupes; when they start to vine, foliar feed with 1 tablespoon borax + 1 tablespoon Epsom salts in 1 gallon of water. Repeat when fruit is 1” to 2” in diameter. Late in the month (for transplanting out for a fall crop) sow: Brussels sprouts, late variety cabbage, cauliflower, kohlrabi. Transplant out in late August/early September (5-6 weeks, with two sets of leaves). Grow cool, possibly under netting to prevent cabbage loopers. Harvest: beet greens, cauliflower, cabbage, radishes, lettuce, turnip greens, onions, peas, rhubarb and asparagus. Harvest herbs: mint, balm, lavender, sage, clary, rosemary, etc. for using fresh, drying or distilling; when just coming into flower. Lay them in the shade or on a screen in a shed to dry. Direct sow tender annuals and half hardy annuals early in the month (before the 15th): zinnias, marigolds, cosmos, annual euphorbia, gypsophila, nasturtiums, scarlet runner beans, Scabiosa atropurpurea, stocks, sunflowers. Sow nigella (succession plant every 2 to 4 weeks until end of month). Finish transplanting perennial starts and annual starts. Stake dahlias, delphiniums; mulch dahlias; check for slugs around auriculas, cannas, delphiniums, hollyhocks and hosta. Take up spring bulbs such as tulips, hyacinths, fritillaries, colchicums, autumn crocuses, etc., when leaves are decayed. Carefully dig and dry them over a wire screen. Propagate from offsets, store in cool, dry place for the summer. Plant strawberry runners into new beds. Thin tree fruits after bloom so no fruit touches (this discourages codling moths); protect (cover) cherries from birds, watch for pests on fruit trees, shrubs and roses. Wash aphids off with a force of water. Set out apple maggot traps in early to mid-June (1 for each dwarf tree; 2-3 for each semi-dwarf tree; and up to 6 for a full-sized tree). Scrape off bugs and apply a fresh coating every two weeks. Remove loose bark and wrap trunks with cardboard or burlap, periodically removing it to capture codling moth pupae. During the growing season, remove branches affected by fire blight, cutting at least 6 inches below affected wood. Sterilize tools with alcohol or a 10% bleach solution between cuts. Set out peach borer traps by the 15th. Trim evergreens and all types of hedges, and be sure to water lawns in hot weather. Below is a list of varieties of tried and true heirloom vegetables that have been around for at least 50 years, and do well in our Western Montana climate. From my own experience, and the experience of other Montana gardeners, the kinds listed below have proven they are well-adapted. Some of these antique seed strains are grown for seed in Montana. All varieties listed are open-pollinated; meaning insects, birds or winds pollinate them. Seed saved each year will produce vegetables of the same, original variety the next year. None of the kinds listed are hybrids (human-pollinated) or GMO (genetically modified organisms). Since no patents exist on these old strains you can legally save seed and grow the same kind year to year. I want to stress that some kinds of vegetables need to be raised in isolation, so they will not cross-pollinate with other plants of their own species. Maize (corn) is one example: it is recommended that corn be isolated by a mile or more from other varieties of corn to keep the strain pure, and a block of over 200 plants are needed to prevent inbreeding depression. But most other vegetables have less complex requirements. Some vegetables are biennial, meaning they produce seed in their second year; for example cabbage and carrots. These will need special handling. If you plan to save and grow your own seed, it might be a good idea to research the best methods to do so for each type of vegetable. Some vegetables self-pollinate and are easy to save seed from; with these, you can be assured of getting the same variety by separating different kinds of the same species. The following will produce seed of the same strain (and self-pollinate) when separated by only a few feet: beans, lettuce, peas, and tomatoes. Two excellent books on seed-saving are: The Heirloom Gardener by Carolyn Jabs and The Complete Guide to Saving Seeds by Robert Gough and Cheryl Moore-Gough. The second book was written by two professors at Montana State University in Bozeman. Storage Onion ‘Southport White Globe’ (110 days): An American heirloom, pre-Civil War onion originally from Connecticut. This onion is a long-day onion, so seed needs to be started in early spring and planted out so it will begin bulbing in the summer long days. The onion is globe-shaped with purplish-red colored skin and the flesh is white. It has a mild flavor, is a good yielder and stores well. There is a ‘Southport Red’ storage onion also, with the same good qualities. Bunching Onion ‘Heshiko Evergreen’ (65 days): An heirloom Japanese onion that can be sown in spring, or in fall for a crop the following spring. It never makes bulbs, but grows into little clumps that can be divided into 6 or more plants in the fall. I found this to be a very productive variety, flavorful and tough. Use it as scallions, thinning as the season goes on. ‘Walking Onion’ (Tree Onion): This is a very old European, or possibly Egyptian, perennial onion that forms small clusters of bulblets, or baby onions, on the tips of the leaf stalks. These can be replanted for more onions. The flavor is pungent and sweet. The bulblets can be used for pickling if you have enough extra saved out for propagation. Harvest the little bulblets in summer and replant some for next year. Leek Giant of Musselburgh’ (105 days): A tough, cold-hardy leek of large size, dating to the 1830s, from Scotland. The stalks are very large, to 3 inches in diameter. The flavor is mild, and the plants are reluctant to bolt. Harvest can continue into November, or longer if cloched. Another good cold-hardy leek is ‘Hannibal’ (95 days): not quite as old as ‘Giant of Musselburgh’, but very early-maturing, with a mild flavor. Carrot ‘Red-Cored Chatenay’ also called ‘Red Chatenay’ (65 days): This variety was introduced into America from France in 1929, and may be much older. I have grown ‘Chatenay’ carrots since I was a boy; the flavor is sweet, the texture is dense and crunchy. This variety does well in our thin, rocky soil as it has shorter roots and does not split as often as other kinds do. Carrot ‘Parisienne’ also called ‘Parisian Market’ and ‘Tonda di Parigi’: A very old orange carrot, from the 1880s or before, with small, round globe-shaped roots about the sizer of a ping-pong ball. They are not as sweet as ‘Chatenay’, but are very early and do well in shallow, rocky soils. The flavor is mild and pleasant. ‘Nantes’ carrot, from the 1850s is another sweet, rather short, orange carrot that does well here. Beet ‘Chioggia Candy Stripe’ (60 days): is a pre-1840s heirloom from Italy. It was in the U.S.A. before 1865. The roots have rings of red and white, like peppermint candy. The flavor is mild and sweet. The greens are excellent also. Beet ‘Bull’s Blood’ (50-60 days): This beet originated in the 1840s and has dark red foliage that is beautiful in the garden and colorful when used in salads. The roots must be harvested small (2” to 3”) or they will become woody. Chard ‘Red Ruby’ (55 days): This chard dates to 1857 and is also called ‘Rhubarb Chard’. The stems are a beautiful red, and the leaves have red veins. The seeds should be planted in late spring—early June, to prevent bolting. The beautiful leaves continue all summer into fall. Spinach ‘Viroflay’ (47 days): A tall plant with dark green, smooth, trowel or arrow-shaped leaves. The flavor is mild, with low acidity. ‘Viroflay’ dates to 1866, and is from France. My plants produced a long time before bolting in very hot (over 100 degrees F.) weather. A good fall crop will mature if you plant a second crop in July-August. Cucumber ‘Lemon’ (65-70 days): A good, juicy, early type of cucumber from the 1800s with a very mild flavor. The fruit are round; best picked about the size of a small lemon or apple, and the plants are productive. Immature green fruit can be harvested as well. It does very well in cold seasons. ‘Boothby’s Blond’ is another early yellow cucumber with mild flavor, though I found it to be not as productive as ‘Lemon’. Cucumber ‘Straight Eight’ (62 days): A smooth, straight heirloom cucumber growing to 8” long, mainly used for slicing. The fruit appear early and the plants are vigorous and productive. ‘Straight Eight’ is from the 1930s and won the All-American Selections award in 1935. Summer Squash ‘Early Summer Crookneck’ (58 days): An ancient, Native American variety with a rich, buttery flavor, a firm texture and pale yellow skin. The best time to pick for fresh use is when the fruit are 4” to 5” long. Squash left on the vine longer, then harvested and stored, will keep through fall into winter. The plants are very productive and healthy. This squash can be steamed, sautéed, baked or grilled. Summer Squash ‘White Scallop’ (50 days): Another ancient Native American squash that is very productive and healthy. The fruit can be picked when very small, 2” or so and steamed or sautéed with other baby vegetables, or left to mature to about 3” and baked or fried. There is a ‘Yellow Scallop’ summer squash, which is also ancient and only differs in color. Winter Squash ‘Lakota’ (100 days): A rare, ancient Native American variety grown by the Lakota Sioux along the Missouri and its tributaries. ‘Lakota’ is a unique squash, with beautiful coloring, in red-orange and green stripes. The fine-grained flesh has a sweet nutty flavor. The Lakota used this squash for winter food. It was cleaned, sliced in ½ inch thick pieces and dried in the sun. The dried pieces keep well and were easily rehydrated in soups and stews. This rare, old variety makes a wonderful crop for sustainable gardening and farming. Pumpkin ‘Long Pie’ (100 days): A very old pumpkin with an elongated shape, ‘Long Pie’ was first recorded in 1832 in Maine, but it may be a much older, Native American variety. Illustrations of a very similar pumpkin brought from America are depicted in Gerard’s Herball of 1596. This pumpkin is bright orange with sweet flesh and makes terrific pies. It also will ripen in storage if picked while still showing some green. This pumpkin is grown for seed right here in the Mission Valley. Peas ‘Mammoth Melting Sugar’ Snap Pea (65-75 days): A high-yielding heirloom variety with stringless pods 4” to 5” long. If picked often, as long as the weather stays cool, the vines will produce longer than other varieties. The pods are sweet and best picked before peas inside get too large. I use them for fresh-eating, stir fry dishes, salads and for freezing. Peas ‘Tom Thumb’ (50-55 days): Introduced in 1854, this is a dwarf variety that needs no trellising. It grows 8” to 9” tall. Usually this pea was grown as a shelling pea, but the pods are sweet and tender and can be used as a snow pea if picked young. This pea is very good early and late in the season as it prefers cool weather. The variety was named after the Barnum & Bailey Circus performer Tom Thumb. Beans ‘Blue Lake Bush’ Snap Bean (53 days): The pods of this variety are 6” long, stringless and tender when cooked. A relatively young heirloom (from 1961) ‘Blue Lake Bush’ has excellent flavor. It is one of the most popular green beans. Pole/Bush Beans ‘Arikara Yellow’ (80-85 days): This is an ancient Native American variety from the Arikara Nation of the Dakotas. It is a short pole bean or tall bush; kind of in between in height. The beans are tan or creamy yellow and very productive; they can be used as snap beans or shelled and dried. The plants are drought tolerant, a virtue common to many antique American vegetables. This variety was described by Lewis and Clark in 1804 and was grown by Thomas Jefferson at his home in Virginia. Tomato ‘Stupice’ (55 days): Of all the 18 varieties of tomato I grew last year, ‘Stupice’ was the most productive. It was the second earliest, following ‘Glacier’ another early, but rather acidic tomato. ‘Stupice’ was much sweeter and more flavorful and kept coming on well all season. This variety is an heirloom from the Czech republic, an area with rather short, cool summers just as we have. The fruit are about 3 to 6 oz. on semi-determinate plants with disease-resistant potato-leaf foliage. Tomato ‘Siletz’ (60-65 days): Nearly old enough to be an heirloom, this tomato is a determinate slicing variety with larger fruit (10-12 oz.) than many early tomatoes. The rich tomato flavor is excellent. ‘Siletz’ was bred in Oregon by Dr. Jim Baggett of OSU for fruit-set in cool weather. It has very few seeds, is very productive, very disease resistant and resists cracking. Tomato ‘Black Krim’ (70-75 days): A very old variety originally from the Ukraine. The fruit are deep red, to black with a greenish flesh. The flavor is very sweet; the tomatoes are juicy and large. It has been found to be one of the most nutritious tomatoes. Tomato ‘Cherokee Purple’ (80-85 days): A tall Native American heirloom variety that is a long-season tomato for us. Mine began to mature fruit before frosts and the flavor was great! The fruit are big 13-14 oz. purple, flattened globes with green shoulders when ripe. You will have to stake, or even better, cage this tomato. It would be a good idea to get it in the ground as early as possible and have a tunnel or cloche ready carry it through a longer season, because it is definitely worth extra trouble. You could also grow it in a large pot with a cage and move it inside if we get a cold snap. Paste Tomato ‘Heinz 2653’ (68 days): Another vegetable grown right here in Montana from seed, so you know it is well-adapted. It is earlier than most paste tomatoes, and conveniently, the fruits all ripen about the same time, which is great if you want to can, make sauce or ketchup. The plants are short and disease-resistant with firm, 3-4 oz. fruit. This variety was developed years ago (1930s) by the Heinz ketchup company. Eggplant ‘New York Improved’ (75 days): The oldest surviving American Eggplant (before 1865) and an early variety (though not the earliest nowadays considering all the new varieties of eggplant). ‘New York Improved’ has shiny, purple fruit; pear-shaped and medium sized. It is good baked, as in eggplant parmesan, or fried. Sweet Bell Pepper ‘California Wonder’ (65 days): A popular variety all over the U.S.A., producing large, blocky peppers about 4” square. They mature to deep green or red when ripe. ‘California Wonder’ does well in our cool summers. A good way to get lots of fruit is to plant larger plants, and pick off any flowers that appear before June 21, the summer solstice. The plants will then continue to set blossoms all summer. If allowed to set fruit before the solstice, the plants stop blooming and set the one crop of fruit rather than continuing to produce. This applies to most types of peppers. Hot Pepper ‘Early Jalapeno’ (65 days): This variety and ‘Cayenne long Slim’ were the first peppers to ripen in my garden each season in the last few years, and both are very productive. Both varieties are from the early 1800s or before. ‘Early Jalapeno’ keeps on producing lots of fruit, also. These peppers are both on the upper scale of heat, for most people, but about 2/3 up the chart to the hottest peppers, like ‘Habanero’. Head Lettuce ‘Tom Thumb’ (47 days): Dating to the 1850s, and named for the famous circus performer, ‘Tom Thumb’ head lettuce is the oldest American lettuce variety still in cultivation. The heads mature to 6” or 7” and have a firm, crisp texture. You can grow 4 plants in one square foot. One head of this lettuce makes a perfect salad for one person; just like a fine dining experience! Head Lettuce ‘Buttercrunch’ (50 days): This is a Bibb-type lettuce that forms a loose rosette of leaves. The variety is bolt and heat resistant, giving you a longer season to pick. The flavor is buttery-rich and the texture is pleasantly crunchy. It stays mild in flavor in hot weather longer than other lettuces. ‘Buttercrunch’ is almost an heirloom, originating around 1960. Broccoli ‘Calabrese’ (60 days): This broccoli originated in Italy, where it has been known for a long time; it arrived in America in the 1880s. The plants are dark green and produce 5” to 6” heads with many side shoots. A great advantage of this variety is that side shoots will grow out after the main head is cut, so harvest continues. This is a very good, insect-resistant variety of broccoli. Kohlrabi ‘White Vienna’ (50-60 days): Kohlrabi does well in our climate and is a delicious addition to salads. ‘White Vienna’ is very old, originating before 1860 and the flavor is mild and tasty. Cauliflower ‘Snowball’ also called ‘Erfurter’ and ‘Early Snowball’ (55 days): A variety developed by Peter Henderson, an American market gardener, in the 1850s and ‘60s. The plants yield early, with mild, flavorful 5” to 6” heads; somewhat self-blanching. The plants are rather small compared to other Brassicas. Cauliflower ‘Purple of Sicily’ (90 days): An heirloom Italian variety from the 1800s or earlier, this cauliflower is very insect resistant. It is quite cold-resistant as well. The heads are bright purple, and cook to bright green—looking like broccoli, but tasting like cauliflower. ‘Purple of Sicily’ is one of my favorite vegetables! Cabbage ‘Golden Acre’ (65 days): A good variety to plant for an early cabbage crop, ‘Golden Acre’ produces tender, dense, 5” to 7” heads. Excellent used fresh, for cole slaw and stir fry dishes. An old kind, from the 1920s. Cabbage ‘Late Flat Dutch’ (100 days): Sometimes this variety is listed as ‘Premium Late Flat Dutch’. It has been grown since the 1860s and is becoming more difficult to find in seed catalogs. The heads weigh 10 to 15 pounds and are wonderful for slaw and sauerkraut. This is a very large, late-maturing cabbage that stores well. Good storage is an important quality for self-sufficient and sustainable farming. Many heirloom vegetables produce crops that store well; an important virtue in the days before refrigeration and mass-marketing. Kale ‘Nero de Toscana’ (‘Dinosaur Kale’, ‘Black Magic’) (50 days): Kale is quite nutritious and cold-hardy. It is a very old variety, dating to the early 1800s. The leaves are very dark green and loaded with nutrients. The plants are insect-resistant, and are good fresh in salads, or added to stews, and soups. Smaller, younger leaves are best for fresh use and the larger ones for cooking. Sweet Corn ‘Golden Bantam’ (78-80 days): An 8-row, golden yellow sweet corn from 1902, with ears that grow to about 6” long. It was introduced by Burpee Co. and was one of the first yellow types to be commonly grown by American farmers, who grew mostly white sweet corn before 1900. ‘Golden Bantam’ is still listed in the Burpee catalog, among numerous modern hybrids, which we cannot save seed from. Since this variety is early-maturing and adapted to cooler conditions, it does well in Western Montana, often performing better than most hybrids! An important factor is to pick ears young, in the milk stage for sweet corn, then a bit later for parched corn, and later for dry storage flour corn. Popcorn ‘Tom Thumb’ (85 days): Another dwarf, early vegetable variety from the 1850s. The plants are about 3 Ft. tall and produce 3” to 4” ears. The variety is well-adapted to cool summers, and this one is grown for seed right here in the Mission Valley. This is the time to plan your 2017 garden. Seed racks will be in garden stores soon. Nowadays there are several companies selling organically grown seeds, some of them grown right here in the Flathead area! January is an excellent time to test the germination rate on your saved seeds. You can get a rough estimate of percentage if you sprout some now. Put ten seeds folded into a moist paper towel. Place the moist towel on a plate, loosely covered with plastic wrap or waxed paper and put it in a warm place to test germ. The top of the refrigerator is a convenient spot to do this. If 9 out of 10 seeds germinate you can bet on about a 90% germ. If a variety germinates poorly, you can plant extra seeds if you have them, or buy fresh seed. Also, check past records and eliminate any varieties that you did not like, or did not do well in your garden. Composted manure can be spread on vegetable beds, right on top of the snow if you want. Spring melt and rains will draw nutrients down into the soil. This month is a good time to repair garden tools, and obtain or make plant supports and cold frames. Locate frames and hotbeds for winter/spring growing outside in sunny, protected locations. Check stored fruits and vegetables for spoilage. Watch cold frames; admit air on days when the temperature goes above freezing and be sure to cover them at night. Clean and weed lettuces and other winter greens growing in cold tunnels or frames. Use leftover Christmas tree boughs to mulch perennials, strawberries, roses, etc. Prepare any planned garden designs. Be sure to rotate planting locations of vegetables and flowers every season for best health and disease prevention. Indoors, sow strawberries and perennials early. Beginning the 15th, sow cauliflower and cabbage seed inside for growing in frames. Sow eggplant, onions, leeks, and early peppers. Sow perennial herbs: oregano, thyme, feverfew, Greek oregano, lavender, rosemary, chives, chamomile, hyssop, horehound, catnip, parsley, rue, lemon balm and salvia. Harvest winter greens from frames and tunnels as well as spinach, lettuce, kale, chard, onions, parsnips, leeks and carrots. Sow primrose and auricula seed in a cool greenhouse; protect auriculas from severe frost and rains. Ventilate auriculas and other alpines in the greenhouse—keep plants on the dry side as they will be dormant. Prepare to top dress containerized plants (in a cool greenhouse) with manure or compost in February. Ventilate sweet violet frames daily; pick off dead foliage and keep the glass clean. Transfer potted sweet violets, pansies and violas to the greenhouse to flower. Other plants (previously potted) to force inside now include: honeysuckle, roses, jasmine, carnations, sweet William, wallflowers, stocks, narcissus, ranunculus, early dwarf tulips and lily of the valley. Take cuttings of geraniums and fuchsias. Force potted strawberries (potted in Sept.) in hotbeds or greenhouse. Check winter mulches and covers; mound up snow to keep perennials and roses protected from dry cold. Have a great gardening year in 2017! Early in the month, prepare beds for next spring’s early crops; add manure and trench into furrows to receive frost (this will break down and lighten/feed the soil). Check over which varieties of flowers and vegetables you liked or disliked, which ones did well, and make a note of it. Keep records up to date. Check stores of fruits and vegetables and discard spoiling ones. Clean all your tools, oil wooden handles and replace cracked ones. Drain gas and oil out of lawnmower for winter. Finish planting garlic, shallots, and Egyptian walking onions. Early in the month, if not done earlier, harvest and store cabbages. To store them, turn them upside down to dry, take off extra leaves and place them in a trench of sand and cover with a wet-proof cover open at both ends to keep them dry. Close the ends of your cover with straw when frosty. Also, to store beets, carrots, parsnips, turnips, salsify for winter: dry and cut tops off. Dig a pit in a dry place if possible. Put down 2 inches of sand, then roots, then more sand, alternating. Then cover with sand again and straw to protect them. 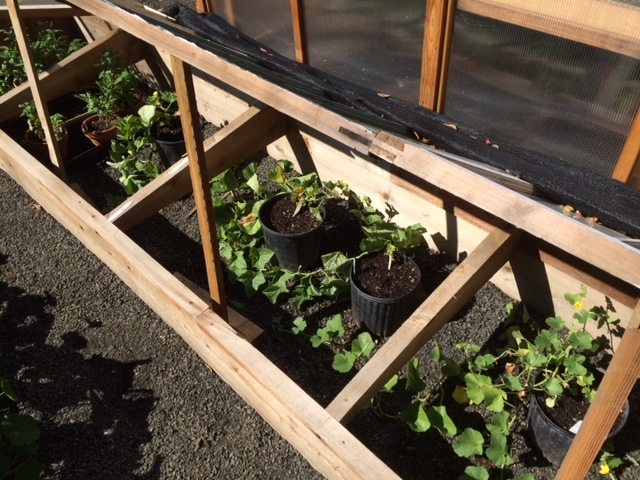 Admit air to cold frames and greenhouse on sunny days; pick off any mildewed or moldy leaves. Force asparagus in hotbeds. Manure outdoor asparagus and rhubarb to 4 inches deep. Weed onions, leeks, spinach, mache, cresses. In frames: when it is cold, cover lettuces, cabbages, etc. Harvest late and frame–grown cabbage, spinach, carrots, peas, cauliflower, lettuce, broccoli, Brussels sprouts. Finish dividing and replanting perennials before winter freeze-up. Transplant seedling perennials and flowers into flats; keep them in a cold frame or cold greenhouse. Mulch primroses, bleeding hearts, and any marginally hardy perennials with pine or fir branches. Pot up double daisies; keep in frames. Move potted flowers to frames to protect them from heavy rains. Take and root cuttings of Pulsatilla. Cut back established pansies, collect violet seed, continue to ventilate frames. Prepare pansy and violet beds for planting. Finish planting bulbs out and plant bulbs to be forced in pots. Weed bulb beds and spread bone meal if not done last month. Put poultry netting over newly planted tulips, crocus and hyacinths to discourage squirrels. In the greenhouse admit air; the plants will be at rest. Keep foliage dry, do not over water or not at all! If mold appears, dust with sulfur. Plunge pots of border auriculas, primroses and carnations up to the rims into gravel or soil in a frame. Be sure to give air. Cover frames if frosty and cold, letting no sun shine on them when frozen. If you have bulbs, perennials, roses or shrubs growing in pots outside, be sure to sink them up to the rims into soil, sawdust or gravel to protect them from cold over winter. Weed fruiting shrubs, add manure to raspberry beds. Finish storing apples, pears, etc. Clean all leaves and mummy fruit around trees to prevent disease and discourage insects. Sow seeds of fruit trees and rootstocks. Make hardwood cuttings of Prunus and Vitis cultivars. Finish planting deciduous shrubs and trees. Layer clematis, divide Mahonias; take cuttings of lavender, Forsythia, Rubus and lilacs. Bring in any remaining vegetables to ripen, or cover them with a row cover designed to take frosts into the mid-20s. Plant bulbs, wildflower mixes and hardy annuals. Harvest apples and pears, and sow seeds of hardy trees and shrubs. Have row covers ready for tender plants that might succumb to fall frosts. 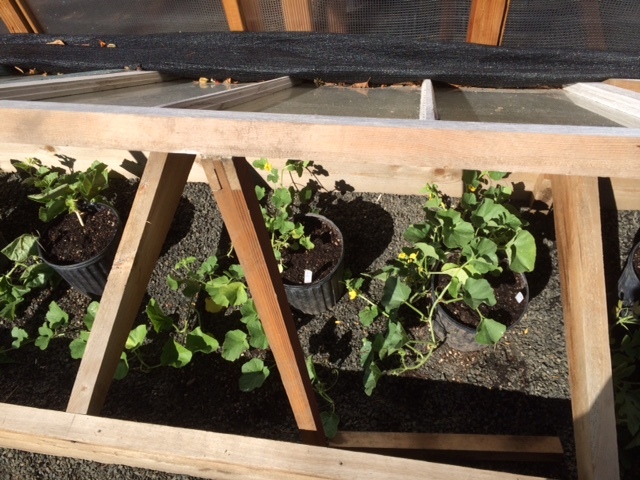 Crops can still be harvested in cold frames and under row covers into November. Ventilate plants in frames and give air and water freely. When it is cold, cover with mats or straw and do not let the sun shine on an open frame full of frozen plants. Harvest Brussels sprouts, cauliflower, cabbage, carrots, lettuce, spinach and herbs. Harvest and store cabbages late in the month: Turn them upside down to dry, take off extra leaves and place them in a trench of sand and cover with a wet-proof cover open at both ends to keep them dry. Close the ends with straw when frosty. Thin spinach and lettuce planted last month. If you have protected your pepper plants from frosts and heavy frost is on the way, pull up the plants and hang them upside down to ripen fruits. Harvest ripe squash and pumpkins, leaving a one to one and a half inch stem. Dig, divide and transplant garlic and shallots. Hang onions to dry in an airy cool place. Cut asparagus and perennial herbs back before winter. Carrots may be left in the ground and covered with two feet of straw, leaves or peat moss to pick as needed most of the winter. Plant bulbs this month, finishing by November 1; give a top dressing of bone meal to the previous season’s bulbs beds. Divide and replant peonies and plant wildflower seed. If not already done, dig tuberoses, dahlias, amaryllis, glads and other tender bulbs. Spread them out to dry in a warm room, clean off hair roots and decaying foliage and pack them up in dry boxes of sawdust. Keep your bulbs in a cool, dark, dry, frost-free location. Weed established bulb beds and spread bone meal as a top dressing. Watch for leafhoppers on roses and spray before severe frosts occur to get last generation before winter. To protect tender roses over the winter in cold areas, mound each plant with soil about 6 inches deep and place a layer of evergreen branches over that. In the spring the soil can be removed gradually, about an inch at a time. In the spring, uncover the plants gradually. Use a gentle jet of water from a hose once a week or so, finishing about May 20. If a heavy late frost threatens, place the evergreens over the crown of the plant again, removing them when weather warms. FALL IS FOR PLANTING TREES, SHRUBS, ROSES AND WILDFLOWER SEED! My pictures show heirloom French cantaloupe ‘Prescott Fond Blanc’ and ‘Ananas D’Amerique a Chair Vert’. The containers were too small to mature the fruit, so I repotted them into much larger 24″ by 24″ pots. The frame helped ripen the fruit in the climate of cool western Oregon. Raising vegetables in containers is an excellent option for those of us who are living in a dwelling temporarily, are short of space, or have poor soil. Containers are useful and versatile; pots can be moved around if a location is too hot, windy or shady. Plants that enjoy heat, such as melons, squash, peppers, tomatoes and eggplant can be placed in front of a warm south or west wall to ripen faster. Also, if spring cold weather threatens, pots may be moved inside overnight, or even a few days for protection. The same advantage applies to the fall season; if weather turns cold and your crop is not yet ripe you can bring pots inside. Containers for vegetables should be at least 12 inches by 12 inches for a single tomato or eggplant, but much larger containers are needed for melons, squash and pumpkins—at least 24 inches by 24 inches for each plant. Smaller crops, such as carrots, beets, broccoli, cabbage, Swiss chard, spinach, lettuce, etc. need a container at least 10 inches deep, and yields are better if the pots are 24 to 36 inches wide. For peas and beans, some gardeners have good success with containers shaped like long rectangles, perhaps 12 inches wide by 48 inches long and 10 or more inches deep. It is easier to move your containers around if you have them on rollers. And if you build your own containers, use non-treated water-resistant wood such as cedar, redwood or cypress. The new fabric containers are useful, reusable and inexpensive, but cannot be moved during the season. The soil mix for vegetables should be rich, moisture-retentive, but quick draining. Plant roots need air to thrive. I use a mix of two parts organic potting soil, one part rotted manure or compost, and one part perlite or sharp sand. Consistent, frequent applications of manure tea, liquid seaweed or a complete organic fertilizer will keep your vegetables growing well. Watering is very important when growing in containers. Check plants every day all season long. If weather is hot and the plants are large, you might have to water two or three times a day. Automatic drip watering systems are an option if you will be away for a few days. When planting seeds, follow directions on the package and read about how to care for each vegetable. “Patio”, “bush” or dwarf varieties of vegetables are good choices for containers. They tend to be compact, productive plants with normal size or slightly smaller fruit. Vegetable seeds that can be planted now (July) include: lettuce, spinach, peas, radishes, carrots, corn salad, and Swiss chard. Plant starts of cabbage, cauliflower, broccoli and kale can be planted now for late fall harvest. Starts of tender vegetables that can be planted in containers now include: tomatoes, squash, pumpkins, cantaloupe, watermelon, eggplant and peppers.